By default Retrace only profiles applications hosted within IIS. If you want Retrace to capture transactions from an application running as a Windows service, please follow these directions. Retrace also supports for the following types of background services. Please review their installation guides for more details. 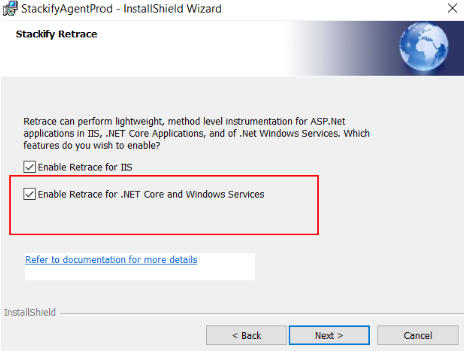 Upon installing check the box for Enabling the Retrace for .NET Core and Windows Services. Replacing the [tokens] as necessary. Note: set RestartIIS=1 if you wish to have Retrace automatically restart IIS to begin profiling of web apps. Option 1. By using the “/EnableStackify” switch For an existing service, double check what the existing path is via the UI or by the command line “sc query” commands. Copy this path so you can use it via command line to update it. In the same folder as the .exe that is being profiled. This would allow you to easily “bin deploy” the file with your app.